A few days ago some friends and I had dinner at Storefront Company, a new restaurant in the Wicker Park neighborhood of Chicago. The meal was amazing, the blood orange martinis were delicious, but the best and most memorable for me was the appetizer. 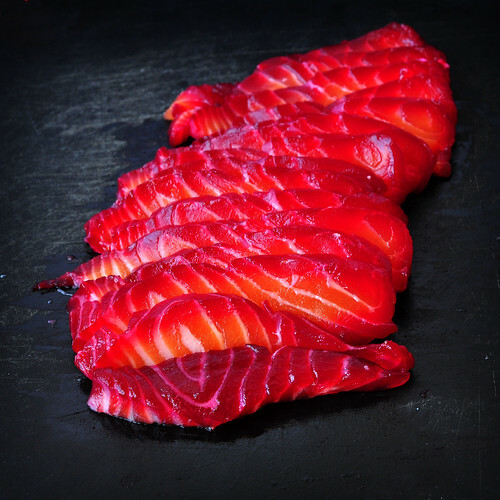 It was mini brioche puffs topped with fennel jam, which in turn held up a very thin bright red slice of beet cured salmon. I think there was some sort of fennel pollen foam on there too. I came to the restaurant before my friends and as I sat at the bar waiting for them, I watched as the kitchen staff assembled these beauties, laying out each and every element with surgical precision. The dish stuck in my head and kept nagging me until I was determined to recreate it at home myself. What came out of that was not exactly the same, but my 5 taste testers couldn't care less and the two dozen trial run samples were gone in an afternoon. The process took me two days, mainly because the brioche recipe I learned at the French Pastry School last summer takes two days, plus the salmon takes 24 hours to cure, but in the end, all the fuss, all the preparation was absolutely worth it, so if you have guests coming that you want to impress, I'd say plan ahead and make this. First up is the brioche. I like this recipe because while it takes time and you need to coddle the dough a little bit, in the end it has never failed me. - In the mixing bowl of a stand mixer fitted with a hook, combine the milk, yeast, and sugar. Sprinkle the 60g of flour over the liquid to cover it evenly and let the yeast proof. - When the yeast is ready you're going to notice little cracks in the flour as the gases from the yeast try to escape. When you see this, add the rest of the flour, the salt, the sugar, and the eggs and knead the mixture with the hook on medium speed until the dough comes together and pulls away from the walls (about 10 min). 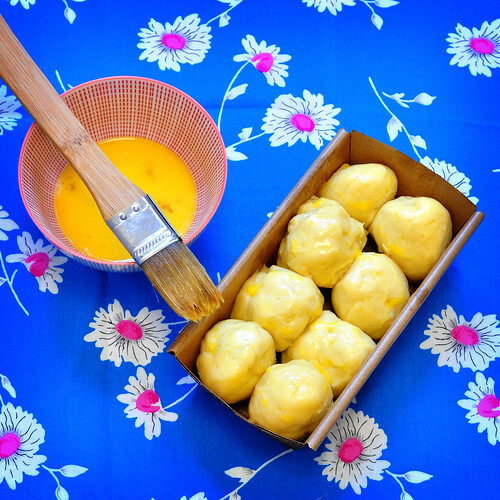 - Slowly add the soft butter to the dough in thirds, waiting until it's completely incorporated before adding more. Once everything has been kneaded in, cover the bowl loosely with saran wrap and a towel, set in a warm spot and let it rise for an hour or until it has doubled in volume. - Punch down the dough, recover with the saran and the towel and place in the fridge for 2 hours to rise again. - Punch down the dough once more, recover again and place in the fridge overnight for the final rise. 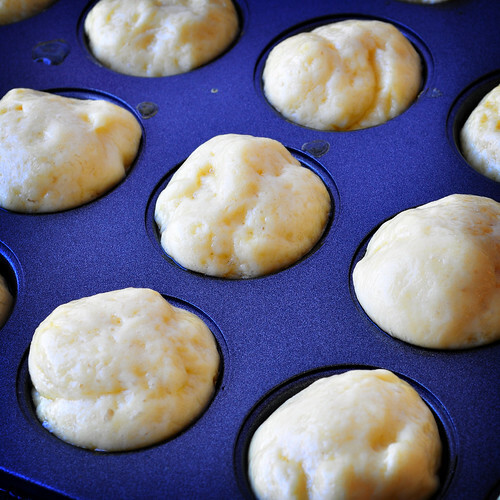 - The next day, shape the brioche into desired shape(s) and brush with a lightly beaten egg. I rolled it into walnut sized balls and put each one into a mini-muffin tin. - Let the dough rest once more for about 1 hour in a warm spot and then bake at 400F for about 15-20 min. or until nice and golden on top. If you're making a loaf, you may need to bake it longer. While the brioche is going through it's first rest, start on the onion jam. - Pour the olive oil and all the sliced onions into a large, deep pan set over medium heat and cook the onions until they're translucent (about 15 min). - Add all the other ingredients and continue cooking, stirring often, until all of the liquid has been absorbed and the onions appear dry (at least 20 min). - Scrape everything into a jar and let cool before storing in the fridge. Sealed tightly, it will keep about a week or so...if you don't eat it all. While the onion jam is cooling, deflate the brioche for it's 2nd rise in the fridge and start on the salmon. Getting the salmon started is child's play, just make sure you start with the freshest, prettiest piece of salmon possible and everything else is fool-proof. 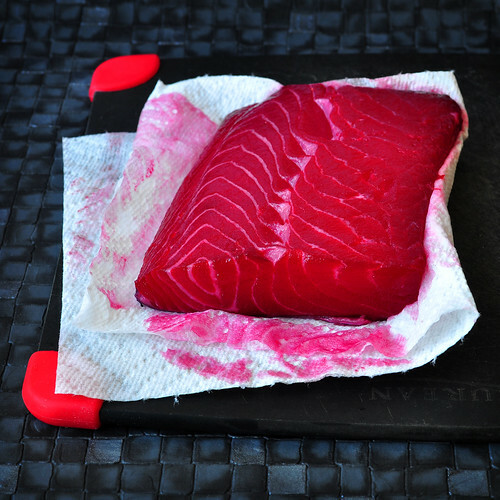 - Wash and thoroughly dry your piece of salmon with a paper towel. Cut it in half right along the "spine". I left the skin on my piece, but if I had taken it off, I'd have a more even cure, so I'd recommend removing the skin. - In a blender or a food processor, combine all the other ingredients and blend to a pulp. - Line a container only slightly bigger then the two pieces of salmon with saran wrap, place 1/3 of the pulp on the bottom, lay out the salmon on top and completely cover the salmon with the remaining pulp. You want the fish to be completely covered. 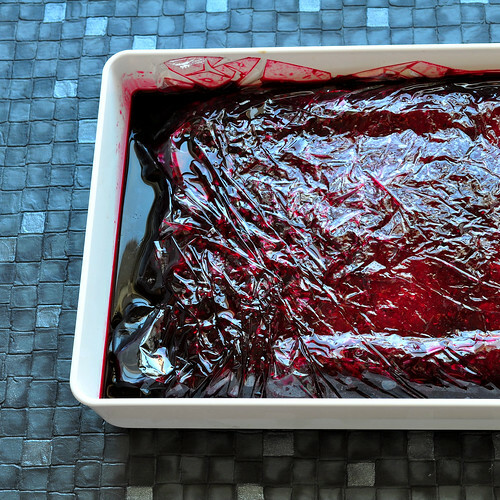 - Cover with more saran wrap and place something heavy on top to weigh it down. I didn't really have anything that would work so I used a box of Mac 'n Cheese and three cans of soup. As you see, almost anything will work as long as the pressure is even and firm. - Set the whole kit in the fridge and don't touch it for 24 hours. When ready, rinse the pulp off of the salmon and dry it again, slice thinly with a sharp knife. 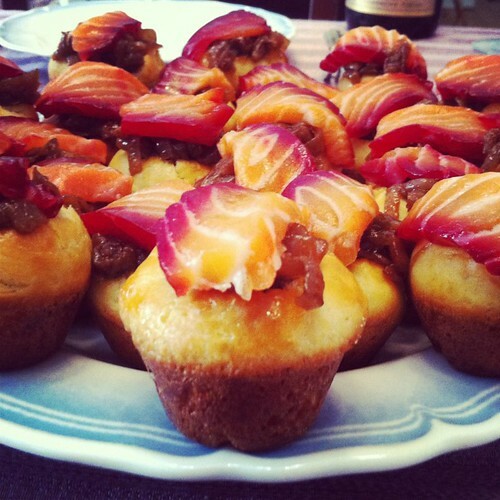 The salmon is good on it's own or as part of my brioche concoction. Mmm, brioche. The color on that salmon is gorgeous! The salmon looks amazing! I've cured salmon once before, and next time I'll try it with beets. Can't wait. This looks festive and I'm sure it's delectable! I am going to make this for a dinner party the first Saturday in April. Just wondering if you blended the beets raw, or if you roasted them first?